website to better serve our past, present, and future customers. Please come back and visit us in the near future. 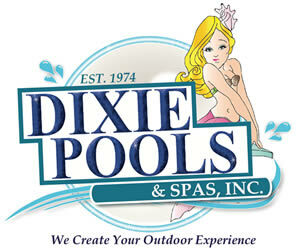 Thank you so much Dixie Pools & Spas! The design process was amazing. The software they use really let us know what our Pool was going to look like. The detail they put into their drawings was unexpected. They even made our house look exactly like ours, and to top it off we had a Virtual Reality walkthrough. WOW!! From the moment we met with our salesman to swimming in our brand new Dixie Pool, it was a pleasure. Everyone we came in contact with was friendly and helpful. This made us feel comfortable and my husband and I knew we had made the right choice. Thank you! At the very beginning of the process Dixie Pools & Spas treated us differently from the other pool companies we met with. From the beautiful information packet they sent us at the beginning, to the attention to detail in the design. My family loves our new backyard paradise (a phrase we learned at Dixie). Thank you so much for our pool and the experience!